Lailat al Miraj is also called Shab-e-Meraj. Lailat is Arabic and Shab is Persian, Urdu and Hindi version of the phrase. Isra and Mi’raj (Isra Me’raj, Israa, and Mi’raaj, Laylat Al-Isra wa Al-Miraj, Lailat al Miraj, Night Journey and Ascension to Heaven) mark the night that Prophet Mohammad traveled from Mecca to Jerusalem, ascended to heaven and returned. It is important to mention that this journey is interpreted in two different ways. It is a spiritual journey to some, and a physical journey to the others, it is a matter of faith and how you came to believe. Fortunately, Pluralistic practices have existed in Islam, even though one believed one way or the other, he or she rarely denigrated the other. Most Muslims have a pluralistic attitude towards each belief, i.e, accepting the other without calling it wrong. Personally, I believe it was a spiritual journey and have no problem if others believe it was a physical journey – the bottom line is what did prophet do with the journey? 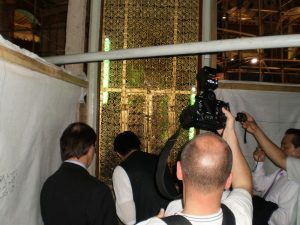 Among the guidance to live, he brought in 5 prayers a day, fasting, Zakath and other pillars of Islam. Please note that in a Muslim calendar, a holiday begins on the sunset of the previous day, so observing Muslims will celebrate Lailat al Miraj on the sunset. Although Meraj is always on the same day of the Islamic calendar, the date on the Gregorian calendar varies from year to year, since the Gregorian calendar is a solar calendar and the Islamic calendar is a lunar calendar. This difference means Lailat al Miraj moves in the Gregorian calendar approximately 11 days every year. The date of Lailat al Miraj may also vary from country to country depending on whether the moon has been sighted or not. The day is observed on the 27th day of Rajab, the seventh month in the Islamic calendar. The Prophet Mohammad (also written as Muhammad) traveled from Mecca to Jerusalem, pictured above. This event gives people the chance to reflect on the importance of prayer. It is a time for people, particularly students, to learn more about Isra and Mi’raj, what it means in the Islamic faith, and how it is applied in practice. According to Islamic belief. One night during the 10th year of Muhammad’s prophecy, the angel Gabriel woke him and traveled with him to Jerusalem. Muhammad prayed at the site of the Temple of Solomon with the prophets Abraham, Moses, Jesus, and others. 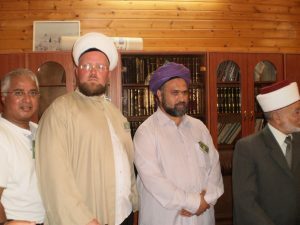 The Imam from Germany, Netherlands and I meeting with the Mufti of Jerusalem.